Magic is such a rare trait in the kingdom of Revarra that practitioners are usually found as children and conscripted right away into military uses for the state. Zaira did manage to escape their attention by hiding in the slums, but it doesn't help keep her out of trouble. In the middle of an outpouring of Zaira's fire magic, she is caught by Amalia Cornaro, heir to The Countess. Amalia was supposed to be a scholar and part of the Council of Nine when old enough to succeed her mother, not a Falconer in charge of a mage. Once the jess was in place, however, there was no escaping the fact that she had to help control Zaira's power, even if she desperately wanted to evade that control. In addition, international tensions are brewing, and Amalia is involved due to her birth and her friendships. 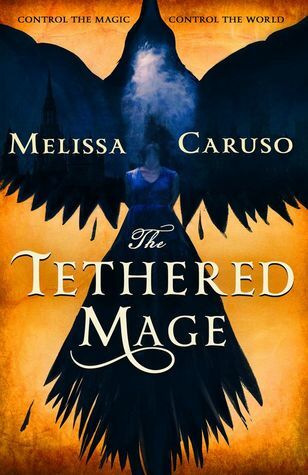 The Tethered Mage is a fascinating read, and I love the concept of magic as it is introduced here. It is dangerous if uncontrolled, especially the powerful and rare kinds. Those that can create magical artifacts aren't considered as dangerous as Zaira, but the applications of their work could be. This is all introduced in a fluid and natural manner; by introducing Amalia into the Falconers, the reader learns about the politics involved in finding those with the mage sign, as well as the implications to "regular" politics now that Amalia has a mage in her control. Whether Amalia actually does or not is irrelevant, it's the perception of it, which clearly mirrors the politics in every era and fantasy realm. The vague rumblings of war and discontent within the empire are revealed a bit at a time, and Zaira provides a lot of color commentary to Amalia's general and somewhat willful naivete regarding the politics she is expected to navigate. They actually wind up working together after a point, and Amalia is able to use the information she learns from Zaira well. Amalia's romance of sorts with the lieutenant is at once in character and out of place. She wants to be her own person and not subject to her mother's planning or the responsibilities of her rank, and she is still a teenager. At the same time, I don't get a sense of what really draws her to the lieutenant in a romantic sense. It seems more a basis for friendship than romance as it starts, as well as her own fascination with his history and rank within the Falconers. The character development is excellent, and I love the world created here. I am looking forward to reading the sequel to this when it comes out in April 2018!